Hotel at The End of The Universe was one of the first hostels in Nagarkot and to this day remains the best place to relax and enjoy the majestic views here. Unlike other hotels in Nagarkot, Hotel At The End of The Universe is perched atop Mahankal Hill, a mere five minute walk from the tourist center, and from here it really feels like you are at the end of the universe. There are no cars to be seen once you make your way up the steps. No dust, nor any loud noises to distract you. From both the restaurant and your bedroom you'll see the spread of the surrounding hills and the Himalayas rising in the distance. 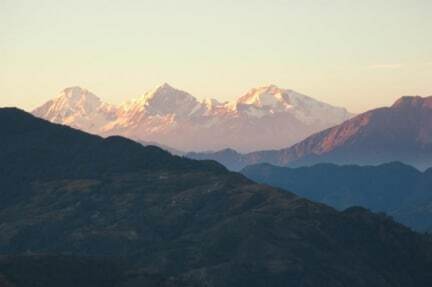 Nowhere else in Nagarkot can you find such peaceful isolation within walking distance of the main street. For all these reasons people return to us year after year, and by now many of them become part of the family (just check out reviews). If you are looking for a clean, peaceful, fun place to stay while you explore Nagarkot's world famous vistas, look no further. 10/10! Staying here was the highlight of our trip. Fantastic team, wonderful food at the restaurant (especially the vegetable kofta), breath taking views of the snow-capped Himalayas. Absolutely loved it. Beautiful surroundings, lovely friendly staff who make you feel welcome. The food is lovely and the rooms are clean and comfortable. We will definitely come here again! Thank you hotel at the end of the universe for a brilliant stay! 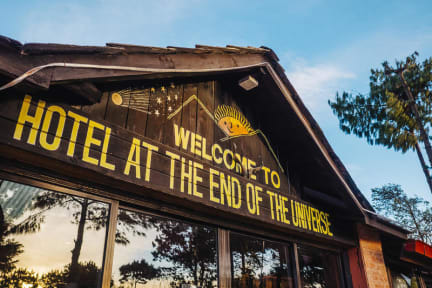 Had a fantastic time staying at Hotel at the End of the Universe. Amazing location and such wonderful staff. Would highly recommend staying here. I stayed at this hotel from Saturday 22nd September to Wednesday 26th September 2018. Run by Oasis and his brilliant staff, this place is a welcome relief from the hustle, noise and dust of kathamandu. The staff were relaxed but welcoming and helpful. If you have any question about anything, you just have to ask them, and they will find out for you. It felt a very safe and secure home from home. Loved it and didn't want to leave. My thanks to Oasis, Noah and the staff. Very lovely staff and great place to just relax and unwind looking at the amazing view of the Himalayas before or after a good panoramic hike nearby. The toilets/showers were a bit dirty and our room had a lot of gaps so bugs came in at night. But apart from that we really enjoyed our time there and wished we could have stayed longer. Bring a lot of warm clothes for sunset/sunrise viewing! Peaceful setting, good crowd of other travelers, really cool room, responsive staff, strong WiFi. Would stay there again. Great staff, they really made me feel at home during my stay! Amazing views from terrace, good food.